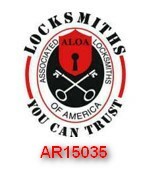 We are your local and professional locksmith and are dedicated to providing the quick response and quality workmanship that you expect. We are involved in our local communities and have probably already done work for your friends and neighbors or business associates. We hope that you will let us help you with your door and lock needs whether it is replacing lost keys, installing replacements for worn door locksets or securing your home or business. Still not sure if we are right for you? We can give you references from our long list of satisfied clients upon request!